The glossary pages provide definitions for over 2680 PA-related terms. If you can't find the term you are looking for, or would like any of the existing definitions to be expanded, please email me − likewise of course if you find any errors in the links etc. Use of this information is conditional upon acceptance of the Disclaimer on the PAforMusic home page. Note that due to font conversions, on some web pages the Greek capital letter Omega, the symbol for ohm, may be displayed by your browser as a 'W'; it should look like a horseshoe shape with a flat base, which, if your browser displays it correctly, now follows: Ω. A bass bin speaker enclosure in which the driver faces backwards and its sound is then directed forwards to two large front-facing apertures, one either side of the driver's location (or above and below it), by means of twin internal folded horns. A slang term for an external power supply unit, for converting mains to low-voltage, in the form of a somewhat larger-than-normal plug that engages directly with a mains outlet, as compared to one in the form of a stand-alone unit equipped with a mains lead terminating in a standard mains plug. Such devices must of course incorporate the appropriate type of mains plug for the specific country of use, and must provide a low-voltage output whose characteristics are suitable for the equipment to be powered by them. The name derives from the fact that these units generally project outwards from a wall-socket outlet more than does a standard mains plug. For further information see Power supply. A term used in the film industry to refer to the background sound made by a crowd of people. Describes a sound lacking in harshness. See also Clarity and Muddy. A lantern that gives an even illumination of a relatively large area of the stage. See also Fresnel. The unit of power, named after James Watt. One watt represents a transfer of energy at the rate of one joule per second. In a DC circuit, the number of watts dissipated in a particular part of the circuit is the current (in amps) flowing through that part of the circuit multiplied by the voltage (in volts) across that part. In an AC circuit, provided that the voltage and current are in phase with each other (i.e. unity power factor), the number of watts dissipated in a particular part of the circuit is the RMS current (in amps) flowing through that part of the circuit multiplied by the RMS voltage (in volts) across that part. For more information on power and power ratings, see Power. See also VA. The 'shape' that would be made by a signal if its voltage (usually) were plotted against time, for example if the signal were displayed on an oscilloscope. The term often refers to a signal having a repetitive shape (such as a sine wave), in which case the waveform has a specific frequency, period and wavelength, and its waveform may be identified from a single cycle. See also Square wave and Crest factor. The distance occupied by one cycle of a repetitive waveform wave, as it travels though some medium (such as air). The wavelength of sound waves in air can be of great importance when considering cancellation effects and other phenomenon such as refraction, reflection, diffraction and comb filtering. Wavelength is inversely proportional to frequency − the wavelength in metres can be calculated by dividing the velocity (speed) of the wave (in the relevant medium) in metres per second by its frequency in Hz. For information on the calculation of sound wavelengths in air, see Speed of sound. As the velocity of electrical signals is extremely high, the wavelength of electrical audio-frequency signals is very large and not usually of any relevance. However, the wavelength of electrical radio-frequency signals can be of importance, most particularly in relation to antennae. An abbreviation for 'word clock'. See also SDIF. A slang term for a floor monitor (because these are usually wedge-shaped). See also Slant. A measurement of noise level in which the noise signal is passed through a weighting filter before the measurement is made. The reason for doing this is usually to take account of the differing sensitivity of the human ear to different frequencies of sound, so that the value of the measurement corresponds more accurately to the level of noise that would be perceived by a person listening to it. The filter is usually an A-weighted type (especially in the USA) or an ITU-R 468 type − for further details see Weighting. See also Microphone Noise Levels on the Microphones page. The process of attributing a different significance, or 'weight', to the different frequencies present within a complex sound or audio signal. The purpose of this is usually to simulate the natural weighting given by the human ear to different frequencies, so that a measurement of a sound, signal or noise level may be made which correlates more accurately with its loudness, as it would be perceived by a person with healthy hearing. However, the situation is complicated by the fact that the weighting naturally applied by the human ear varies according to the loudness of the sound. 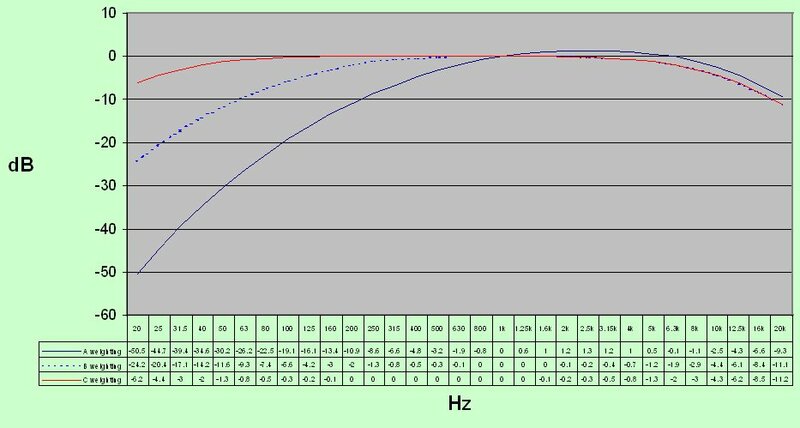 At low levels of loudness, the ear has a rather poor response to bass frequencies, improving quite rapidly until an optimum response is reached at around 2.5 kHz; as the frequency continues to rise the response then slowly falls off again. At high loudness levels however, there is a much better response to bass frequencies, and the response is fairly flat from around 200 Hz to 6.5 kHz. A-weighting, corresponding to the response of the human ear at 40 phons. This is the most common type, and is most frequently encountered in the measurement of noise (because noise in PA systems is usually at a low level of loudness). To achieve this response a bandpass filter centered on a frequency of 2.5 kHz is used; its attenuation increases steadily as the frequency falls below 2.5 kHz (20 dB attenuation at 100 Hz), and increases much less rapidly as the frequency rises above 2.5 kHz (10 dB attenuation at 20 kHz). B-weighting, corresponding to the response of the human ear at 70 phons. This type is the least commonly encountered. It has a similar high-frequency response to A-weighting, but has a rather less severe attenuation of low frequencies. C-weighting, corresponding to the response of the human ear at 100 phons. This type is suited to sound pressure level measurement in loud environments such as rock concerts, dance clubs and noisy industrial environments. It is also generally used for peak level measurements. It has a similar high-frequency response to A-weighting, but has a far less severe attenuation of low frequencies. K-weighting, similar to A-weighting but taking into account the effect of the head-related transfer function (see HRTF). This type is especially suited to surround sound level measurements, and is commonly used in broadcast sound level control applications. Two other types of weighting, generally used only in noise level measurement (especially of microphones), are 'ITU-R weighting', specified by ITU-R 468 (or DIN 45405) and Z-weighting, which has a flat response from 20 Hz to 20 kHz (± 1.5 dB). For further information on microphone noise levels, see Microphone Noise Levels on the Microphones page. Note that, when a weighting is used in the measurement of a signal (or noise) level, there is an implicit assumption that, overall, no modification of the frequency response (or other modification such as distortion) occurs in the system between the point of measurement and the sound waves that are eventually heard (or that would be heard). Note also that the term 'weighting' is occasionally used to refer to the response given by equalising filters such as those used in the recording and playback of analogue recordings − see RIAA and Tape equalisation − though to avoid confusion this usage of the term is best avoided. A filter specifically designed to give more emphasis (or 'weight') to certain frequencies present within a signal, usually in order to simulate some natural filtering effect such as the response of the human ear. Such filters are most often used in the measurement of sound pressure levels and in the measurement of noise levels. Different types of filter will give different weight to each frequency, and so will give a different result to the measurement. Different methods of level detection may also be specified for use with different filters. For more detailed information see Weighting. Describes a sound laden with effects. Compare Dry. Hiring of equipment (usually a complete system) from a hire company, that includes the personnel to assemble and operate it, as compared to hire (usually of individual items) on a 'self assemble and operate' basis. Compare Dry hire. Feedback at a high audio frequency. A particular type of noise, whose level remains constant over the entire audible frequency range. More accurately, frequency bands of equal bandwidth contain the same amount of noise power. See also Pink noise and IEC noise. Refers to unused parts of the radio-frequency spectrum − typically fairly narrow sections such as those between television channels. Some radio microphone systems are designed to locate such spaces and operate at frequencies within them (subject to licensing conditions). A general term for any wireless device (e.g. a radio microphone system) that is able search for white space in order to select the radio frequency at which it will operate, or in order to give the user an indication of which such frequencies are apparently available for use. May be abbreviated to WSD. Describes an effect which has a strong stereo component. See also Width. Describes a signal (often noise) or equipment (often a filter) having a relatively large bandwidth. Compare Narrow-band. A term used to describe the extent to which sounds within a mix deviate from a central position in the stereo image. 'Width' is sometimes an adjustable parameter of stereo effects units. However, the actual 'width' experienced by a listener will depend on a number of factors, particularly upon their distance from the speakers as compared to the distance between the Left and Right speakers. See also Pan, Mid-side pair and Wide. A coil of wire within electromagnetic components such as a transformers, inductors, electromagnetic guitar pick-ups or electric motors. The term is not usually used for the coils of speaker drivers or dynamic microphones (see Voice coil). For further information on transformer windings see Transformer. A device, usually made of acoustic foam, that is placed over the sound aperture of a microphone to reduce the unwanted popping noises that result from plosives (and, in outdoor events, to reduce wind noises) without significantly affecting the quality of the wanted sound. Also known as a 'sock' or a 'pop filter'. See also Basket. The extreme sides of a stage, hidden from (most of) the audience. The moving electrical contact of a potentiometer. It contacts with the track of the potentiometer. A flexible single conductor whose length is very much greater than its diameter, usually having an easily-removed insulating covering or coating. It is used to provide a path for an electric current internal to equipment or within a cable, and may be stranded or solid-cored. A wire within a cable is more usually referred to as a core of the cable. Non-technical personnel frequently use the term 'wire' to refer to a complete cable, but this usage is deprecated by engineers. The amount of current that can be safely carried by a wire is determined by its gauge and by other factors such as the type of insulation it has and the ambient temperature when in use. A microphone that is connected to the PA system by means of an attached cable, rather than via a wireless link. Alternatively termed a cabled microphone. Compare Radio microphone. Describes equipment that is is able to send or receive a signal by a means other than through a cable, most commonly by use of radio-frequency transmission or reception. A separate transmitter and receiver unit that communicate with each other wirelessly. Most commonly refers to a radio microphone system, in which case the microphone itself may or may not be included as part of the system. A person whose job is to install cables and make the required connections to them. See BS 7671 and BS 7909 (UK) and National Electrical Code (USA). An abbreviation for 'wireless local area network', a facility to enable items of data equipment within or in the vicinity of a building (or a temporary structure) to commuunicate with each other wirelessly. See also AES50, AES67 and LAN. An abbreviation for 'Working Load Limit', the maximum loading (expressed as a weight) that can safely be supported by a chain, rope, truss, hoist, cherrypicker, etc., under the most advantageous conditions (working environment, method of use, etc.). The WLL value is typically specified by the manufacturer of the equipment, and so cannot take into account factors relevant to specific real-life conditions of use. A competent person assessing the specific usage situations may need to assign an SWL value that is less than the WLL value. So effectively the WLL value is a maximum possible SWL value, that applies only under ideal conditions. WLL values incorporate a suitable safety factor to allow a substantial margin between between the quoted value and the minimum loading at which the equipment might be expected to fail − generally at least a factor of 8 for these kinds of equipment. Compare SWL. For further information on safety see the Safety page. An abbreviation for 'Windows Media Audio', a digital audio file format suitable for playing on PCs, personal audio players, etc..
A driver which is designed specifically to handle bass frequencies. It is used in a bass bin and as the low frequency (LF) driver in full-range speakers. This term is not very often used by professionals in the context of PA speakers, the term 'LF driver' or 'Bass driver' being generally preferred − it is more commonly used in the context of Hi-Fi speakers. Pronounced "wuffer". See the Amps and Speakers page for further information. Compare Tweeter (but also see Horn (1)). The smallest meaningful unit of digital information in a particular system, for example, one sample of a single channel of an audio signal. It consists of several bits, often comprising one or more complete bytes. A clock signal which indicates the rate at which words are conveyed or processed in a digital system. So, its frequency is the same as the sampling rate. See also Bit clock and Analogue to digital conversion. The number of bits in a word. In an equipment redundancy arrangement, an item of equipment that is normally (or is currently) fulfilling the relevant task. Or, rarely, the singular of the next definition. A slang term for 'working lights'. Generally used in the plural because there would rarely be just one of such lights. Or, of course, the plural of the previous definition. Lights which are not used during a performance, but only to provide light for the crew during the rigging and de-rigging of the system. In a purpose-built performance venue they may be permanent fixtures; otherwise they are mobile equipment and are usually the first items to be rigged and the last to be de-rigged. The process of arranging a cable into a compact series of circular loops (a coil), for the purpose of convenient storage or transport. Typically, in order to avoid damage to the cables by kinking, a specific coiling technique is used such as the over-under method. Wrapping is also known as 'coiling'. An abbreviation for 'white space device'. An abbreviation for 'wide extended graphics adaptor'. A standard interface for the connection of display equipment (such as monitors and projectors) to computers. The standard gives a resolution of 1280 pixels horizontally and 800 pixels vertically. Note that this format gives a less-common aspect ratio of 16:10 (most usually employed for the integrated LCD displays of laptop computers). See also VGA, SVGA, XGA, SXGA, UXGA and DVI. The most commonly encountered standards, their resolutions and aspect ratios are tabled under the entry for VGA.